Dr. Gross is a family physician with a full-time practice at Spectrum Health, where he focuses on HIV and men's health. Since 2009, he has also maintained a part-time practice at Vancouver Native Health Society (VNHS), which provides a full range of health care services to mainly First Nations, Inuit, Metis peoples living in and around the Downtown Eastside. He is a Clinical Assistant Professor in the Department of Family Practice at University of British Columbia. 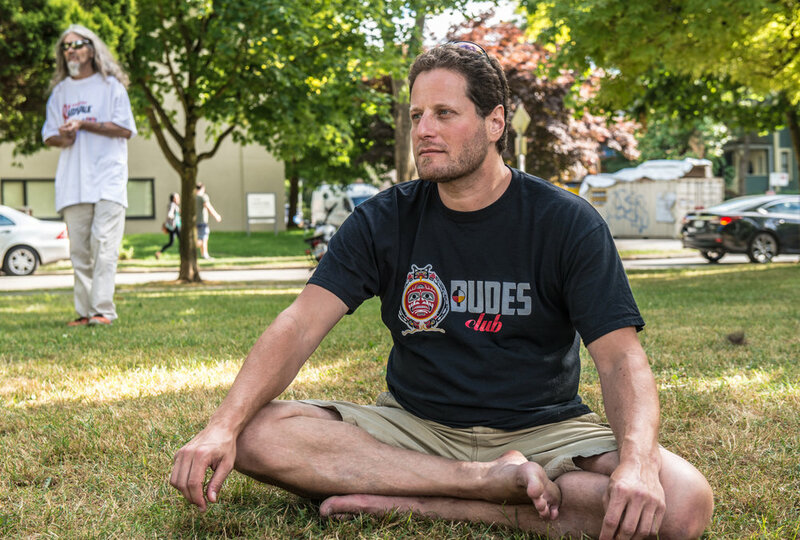 In collaboration with Richard Johnson (link to his bio), he co-founded the Dudes Club in 2010. Sandy is a member of the TALLCREE First Nation from Northern Alberta calls Vancouver home. He has many years of volunteering with non-profit organizations and NGOs, attending/planning/organizing HIV/AIDS conferences, and participating in research committees/projects provincially and nationally. These opportunities have attributed to healthy partnerships and supportive allies for the growth of DUDES Clubs off/on reserve, rural and remote. Sandy believes this is a good way to engage men and to educate in a safe environment on men’s health issues. Originally from Vancouver, Frank has more than 20 years experience in managing and evaluating Community Development, Social Impact, and Education Programs, in 22 countries. He has done leadership capacity building work with over 10,000 people in over 100 rural villages and urban neighborhoods In addition to his role at Dudes Club, Frank also serves as the Executive Director of the Vancouver Association for Survivors of Torture, a Refugee Mental Health organization. He is also a Sessional Lecturer in Social Work and Public Affairs at UBC, UNBC, Langara, Douglas, Native Education College, and Fordham, Rutgers, and Columbia Universities. For 10 years in New York City, Frank was the CEO of Global Potential, providing 5000 youth from low-income communities in five countries with transformational experiences and networks. These individuals were an important part of our research team, establishing the evidence base and guiding the Community-Based Research (CBR) for the work that Dudes continues to do with Men's Health. Dr. Smye’s research addresses inequities related to mental health and addictions systems and services with a particular focus in the areas of women and violence, cultural safety, and Aboriginal mental health. From 2005 until 2014, Dr. Smye was a faculty member with the UBC School of Nursing. In September of 2014, Dr. Smye was appointed as the Director of Nursing, Faculty of Health Sciences at the University of Ontario Institute of Technology (UOIT). Lyana is the research manager for project #2 of the Masculinities and Men’s Depression and Suicide Network, entitled Evaluating and Extending the Aboriginal Men’s Dudes Club Program. She is also a PhD candidate in the School of Community and Regional Planning at UBC. The focus of her dissertation is on urban Indigenous community planning and how that looks at the intersection of law, health, and social service delivery. She is doing collaborative community-based research with the Native Courtworker and Counselling Association of British Columbia. Through her research she is weaving together governance, history, health, and storytelling in support of self-determination for Indigenous communities. Lyana has been involved in several Indigenous health initiatives including promotion of cultural safety training for healthcare professionals and creating culturally appropriate research materials for Indigenous communities engaging in health research. Iloradanon is the Research Assistant for the Dude’s Club Project. She helps with all aspects of the project, from data analysis to maintaining effective relationships with elders and club members. She is a member of the Haida Gwaii Nation with a keen interest in social determinants of indigenous health, feminism, and wellness.